With the process of ageing, the skin’s ability to regenerate itself and shed dead skin (known as desquamation) is slowed, resulting in the buildup of excess cells in the stratum corneum layer of the epidermis. This creates blockages in the skin’s surface and significantly reduces permeability, which affects the health and texture of your complexion. Conditions such as uneven pigmentation, acne, dryness, rosacea, fine lines and wrinkles can all benefit from thorough exfoliation to improve cellular turnover, absorption and smoothing the texture of the epidermis. Exel Skincare Renewal Program provides a safe and even microexfoliation and comes with a range of products to provide optimal results for all skin types. For normal and dry skin. Exel Skin Renewal Active Cream is designed to promote the loosening of the ‘glue’ that binds dead cells together, to induce a gentle and safe micro exfoliation for normal and dry skin types, while being gentle enough for sensitive conditions. Exel Skin Renewal Active Cream contains alpha and beta hydroxy acid microsponges, which gradually release a controlled concentration of the active peeling ingredients. This prevents irritation and keeps the skin at a balanced pH level. AHA’s glycolic, lactic, mandelic and citric acids are proven to have a lightening effect on pigmentation and promotes an even skin tone, while BHA Salicylic Acid adds keratolytic activity, which promotes the peeling and shedding of cells in the stratum corneum layer. Powerful antioxidant Vitamin E helps to prevent visible signs of ageing with its anti free radical properties. It protects and repairs, while improving moisture levels, leaving the skin smooth and luminous. Lipoic Acid is a strong antioxidant naturally occurring in every cell in the body, which has the ability to regenerate other antioxidants such as Vitamins C and E. Due to being water and fat soluble, it has the ability to protect not only the cell membranes, but the inside of the cells as well. It has powerful anti-ageing and anti-inflammatory effects which actively work to reduce puffiness, swelling, redness and blotchiness. It helps to minimise skin roughness and also decreases the appearance of photoaging. This results in a healthy radiant glowing complexion, with an even skin tone and minimised pore size. Directions: Apply onto thoroughly cleansed skin with a pressing motion until completely absorbed. For best results apply in the evening. Exel Renewing Gel Cream is formulated with an increased concentration of active peeling ingredients and is intended for use on oily and combination skin. The light gel texture is easily absorbed and vanishes into the skin, while providing moisture and improving elasticity. It can also be safely used on acne skin conditions, to induce a gentle and safe micro exfoliation. Renewing Gel Cream contains alpha and beta hydroxy acid microsponges, which gradually release a controlled concentration of the active peeling ingredients. This prevents irritation and keeps the skin at a balanced pH level. AHA’s glycolic, lactic, mandelic and citric acids are proven to have a lightening effect on pigmentation and promotes an even skin tone, while BHA Salicylic Acid adds keratolytic activity, which promotes the peeling and shedding of cells in the stratum corneum layer. While undergoing exfoliating and peeling treatments it is of the utmost importance to protect against and prevent free radical damage caused by UV exposure. Exel Sun Protection Cream is specially formulated to provide strong UV protection while maintaining skin health. Aloe Vera Gel: Provides hydration and soothing properties. Vitamin E: A rich antioxidant which repairs the skin, provides free radical protection and increases moisture. Shea Butter: Prevents water loss, softens and soothes the skin. Dermatologically tested, Exel Sun Protection Cream is non-irritating and does not contain PABA. Directions: Apply liberally to the face neck and décolletage 15 minutes prior to sun exposure. For best protection in direct sunlight, always reapply every two hours. Exel Skin Renewal line can be used in conjunction with Exel Renewal Program professional treatments, facials or integrated into an at home skincare routine. 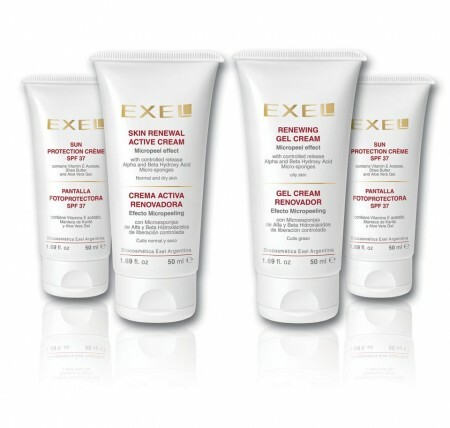 Brighten and even your complexion with Exel Skincare Renewing Products and you will get amazing visible results. Start Preparing Early for the Perfect Bikini Body!